Earlier this week, Cardo Systems announced the North American availability of its 2019 PACKTALK lineup, featuring world-class audio technology from the industry leaders at JBL. They’ve also put out this snazzy video clip, complete with dramatic opening music that makes you think Thanos is going to show up at some point and finger snap half the car drivers out of existence. Much to my chagrin, this did not come to pass. Oh, well. Available now at specialty retailers and Cardosystems.com, the 2019 PACKTALK lineup with Sound by JBL delivers a superior audio experience to motorcyclists and sets a new standard in audio quality for helmet communications systems. Cardo FREECOM 2+ adds range to the two-way rider-to-rider category with a 500m/0.3mi bike-to bike intercom. The company says, “Motorcyclists can now experience the unrivaled, premium sound from JBL with Cardo Systems’ PACKTALK BOLD and PACKTALK SLIM devices. Hailed by reviewers around the world as the “gold standard” for motorcycle communication systems, each PACKTALK model merges its ground-breaking Dynamic Mesh Communication™ (DMC) technology with Cardo’s all-new, natural voice operation feature. DMC-powered devices allow up to 15 riders to wirelessly communicate with the same ease of connecting just two, while also allowing riders to seamlessly join, leave or change positions at a distance of up to five miles without causing a breakdown in communication.” Unlike other manufacturers, Cardo offers natural voice-command, which allows riders to simply say, “Hey Cardo” and the always-on system reacts instantaneously. Activating the device no longer requires a specific action such as push-to-talk, so riders can keep their hands on the bars at all times. Both PACKTALK models with JBL are available with an MSRP of $339.95 for single units and $599.95 for a DUO set. 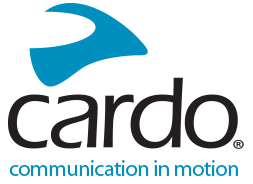 All Cardo devices are IP67-waterproof and all feature a two-year warranty and a U.S.-based customer-support system. In 2003, Cardo was one of the companies creating Bluetooth headpieces for early cellphones. Called Scala, they were special due to their unique wind-suppressing technology. With Scala, users' voice came across crystal-clear and noise-free. Then, one day, riding on a motorcycle to the office, lightning struck. What happens if the same Bluetooth and wind-suppressing technology is wrapped inside a sturdy waterproof shell and attached to a helmet? Now riders could connect to their music, their phone, and to each other.